For the caliph of Cairo, see Al-Hakim II. Al-Hakam II (Arabic: أَبُو الْعَاصٍ الْمُسْتَنْصِرِ بِاللهِ الْحُكْمِ بْن عَبْدِ الرَّحْمَنِ‎, translit. 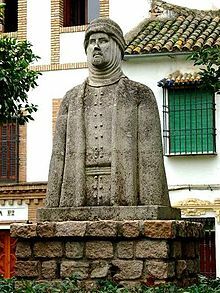 Abū'l-ʿĀs al-Mustansir bi-llāh al-Hakam ibn ʿAbd ar-Rahmān; January 13, 915 – October 16, 976) was an Arab Caliph of Cordoba. He was the second Umayyad Caliph of Córdoba in Al-Andalus, and son of Abd-ar-Rahman III and Murjan. He ruled from 961 to 976. Al-Hakam II succeeded to the Caliphate after the death of his father Abd-ar-Rahman III in 961. He secured peace with the Catholic kingdoms of northern Iberia, and made use of the stability to develop agriculture through the construction of irrigation works. Economic development was also encouraged through the widening of streets and the building of markets. Hakam himself was very well versed in numerous sciences. He would have books purchased from Damascus, Baghdad, Constantinople, Cairo, Mecca, Medina, Kufa, and Basra. His status as a patron of knowledge brought him fame across the Muslim world to the point that even books written in Persia, which was under Abbasid control, were dedicated to him. During his reign, a massive translation effort was undertaken, and many books were translated from Latin and Greek into Arabic. He formed a joint committee of Muladi Muslims and Mozarab Catholics for this task. His personal library was of enormous proportions. Some accounts speak of him having more than 600,000 books. However, Hitchcock (2014: 91-92) argues that any number in excess of 600 is "inconceivable". The catalogue of library books itself was claimed to be 44 volumes long. According to Hitchcock (ibid. ), this may be because "volume" and "page" were confused. Of special importance to Al-Hakam was history, and he himself wrote a history of al-Andalus. Following his death, Hajib Almanzor had all "ancient science" books destroyed. The mathematician Lubna of Córdoba was employed as Al-Hakam's private secretary. She was said to be "thoroughly versed in the exact sciences; her talents were equal to the solution of the most complex geometrical and algebraic problems". The famous physician, scientist, and surgeon Abu al-Qasim al-Zahrawi (Abulcasis) was also active in Al-Hakam's court during his reign. His building works included an expansion of the main mosque of Córdoba (962–966), the Mezquita, and the completion of the royal residence Medina Azahara (976), which his father had begun in 936. Whilst the internal administration was left increasingly to the Berber vizir Al-Mushafi, general Ghālib ibn ʿAbd al-Raḥmān was gradually gaining influence as leader of the army in North Africa. He was chiefly preoccupied with repulsing the last Norman attacks (c. 970), and with the struggle against the Zirids and the Fatimids in northern Morocco. The Fatimids were defeated in Morocco in 974, while Al-Hakam II was able to maintain the supremacy of the caliphate over the Catholic states of Navarre, Castile and León. Al-Hakam married Subh of Cordoba, a Basque concubine. She held sway and strong influence over the court. It is said that al-Hakam nicknamed her with the masculine name Ja'far. She bore him two sons, the first is Abd al-Rahman, who died young, and the second is Hisham II. In his youth his loves seem to have been entirely homosexual. He was known to have openly kept a male harem. The fact that he did not produce a suitable heir before the age of 46 has been ascribed either to him being more attracted to men, although this is only reported euphemistically in the sources, or because he was too absorbed with his books to care for sensual pleasures. Different explanations have been given for Subh's choice of attire. While she may have dressed as a ghulam or a young man to attract al-Hakam (adopting a short haircut and wearing trousers with Al-Hakam supposedly giving her the male name of Ja'far), it is also possible she did it to gain better access to the male-dominated royal court. Al-Hakam II suffered a stroke near the end of his life that curtailed his activities and may explain why he was unable to properly prepare his son for leadership. Modern scholars have speculated that, based on the historical descriptions of his death, it was another cerebrovascular stroke, possibly brought on by the cold weather, that claimed his life in October 976. He was succeeded by his son, Hisham II al-Mu'ayad, who was 11 years old at the time and was a nominal ruler under Almanzor. ^ a b Najeebabadi, Akbar (2001). The History of Islam V.3. Riyadh: Darussalam. p. 145. ISBN 978-9960-892-93-1. ^ Hitchcock, Richard (2014). Muslim Spain reconsidered. Edinburgh: Edinburgh University Press. pp. 91–92. ISBN 978-0-7486-3960-1. ^ Ann Christy, Christians in Al-Andalus:711-1000, (Curzon Press, 2002), 142. ^ Scott, Samuel Parsons (1904). History of the Moorish Empire in Europe Vol. 3. Lippincott. p. 447. ^ Bariani, Laura (2003). Almanzor (in Spanish). Editorial NEREA. p. 66. ISBN 9788489569850. ^ Brill, E. J. (1993). E. J. Brill's First Encyclopaedia of Islam 1913 - 1936 Volume III. p. 223. ISBN 9004097899. ^ Scheen, Rolf (1996). "Vikings raids on the Spanish Peninsula". Militaria. Revista de culturea militar. Complutense University of Madrid: 72. Retrieved 2018-10-05. ^ a b Ruggles, D. Fairchild (2004). "Mothers of a hybrid dynasty: Race, genealogy, and acculturation in al-Andalus". Journal of Medieval and Early Modern Studies. 34 (1): 73. ^ a b Prado-Vilar, Francisco (1997). "Circular visions of fertility and punishment: caliphal ivory caskets from al-Andalus". Muqarnas. 14: 19–41. JSTOR 1523234. ^ Christys, Ann Rosemary (2013-01-11). Christians in Al-Andalus 711-1000. Routledge. p. 106. ISBN 978-1-136-12730-4. ^ Homosexuality, Daniel Eisenberg, Encyclopedia of Medieval Iberia, ed. Michael Gerli (New York: Routledge, 2003), 398–399. ^ Al-Hakam II, Caliph of Cordoba, Marilyn Higbee Walker, Encyclopedia of Medieval Iberia, ed. Michael Gerli (New York: Routledge, 2003), 377. ^ Arjona-Castro, A. (February 1997). "Cerebrovascular stroke, the cause of the death of the caliph al-Hakam II". Neurologia. 12 (2): 78–81. Wikimedia Commons has media related to Al-Hakam II.